Watch this brief (3-minute) film introducing a new multi-centre CGIAR research program, one after ‘more meat, milk and fish by and for the poor’, that has ambitions to do research differently, moving from research products to research outcomes. Developing—and getting into use—big interventions that help transform eight ‘whole farm-to plate livestock and fish value chains’ are what this program is about. Is it doable? Let us know what you think. In this 3-minute film, Tom Randolph, an agricultural economist with the International Livestock Research Institute (ILRI), explains what’s new about the multi-disciplinary and multi-institutional CGIAR Research Program on Livestock and Fish that he directs. ‘Meat, milk and fish are critical to the poor both as food and income’, Randolph says. ‘But while research has hugely increased farm production in rich countries, we haven’t suceeded yet to help the millions of family farms in developing nations to raise their production very much. We’ve been doing a lot of good science a lot of good research over the years. But all that good science has not translated into significant improvements in the amount of milk meat and fish that people are able to produce and put on their tables for themselves and their communities. ‘To change this, we’re experimenting with a new approach. 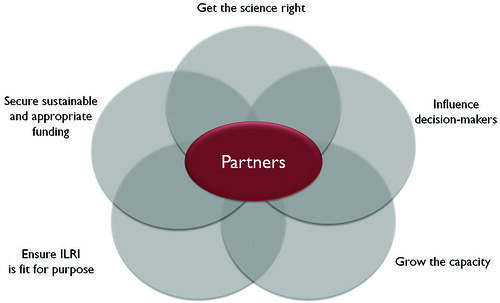 The focus of research in the past was on research products. Now we’re making ourselves accountable for getting research into use. This is what a new program called More Meat, Milk and Fish by and for the Poor is all about. ‘So what’s different about this program? Well, for one thing, we’re addressing the whole way these foods move from small farms to tables. This so-called ‘food chain’ includes producing, processing, selling and consuming meat, milk and fish. ‘And we’re working to design big interventions that can transform whole farm-to-table chains in selected countries. This will help us scale up our research, with direct benefits for large numbers of people. ‘Also, we’re teaming up early with development partners who know how to take these interventions to scale. ‘Finally our program is focusing all its research capacity on just 8 farm-to-table livestock and fish systems selected because their successes can be replicated in many other regions. These 8 systems include small-scale dairying, goat and sheep raising, pig production and aquaculture in 8 countries in Africa, Asia and Latin America. ‘Our intention is to show that small-scale farmers and businesses, already central to feeding the world’s poor, will be key to food security up to the year 2050, when global populations peak. We want to demonstrate that their systems can be transformed. And this kind of science can make a big difference in everyone’s lives. 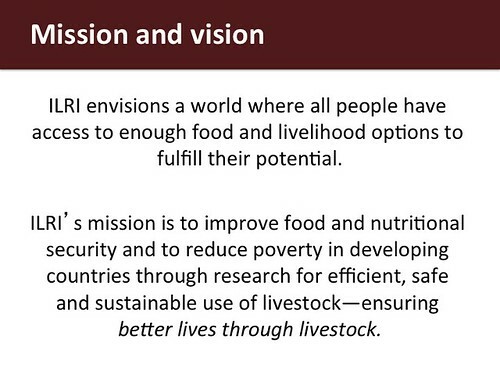 Below, view a slide presentation version of the film above by Tom Randolph: ‘More meat, milk and fish by and for the poor: How the Livestock and Fish Research Program Helps Improve Access to Critical Animal-source Foods’, Mar 2013. More meat, milk and fish produced by and for the poor: A first review of a new research program, 30 May 2013.